When two people who have been happily married for 60 years offer marriage advice, it’s a good idea to take notes. That’s what I did when visiting my sweet grandparents last month. They don’t offer marriage or life advice in an instructional tone – it just comes out in their normal conversation. My life has been tremendously impacted by my grandparents, and I’ve shared a few observations from their marriage before. Today’s post is even better! 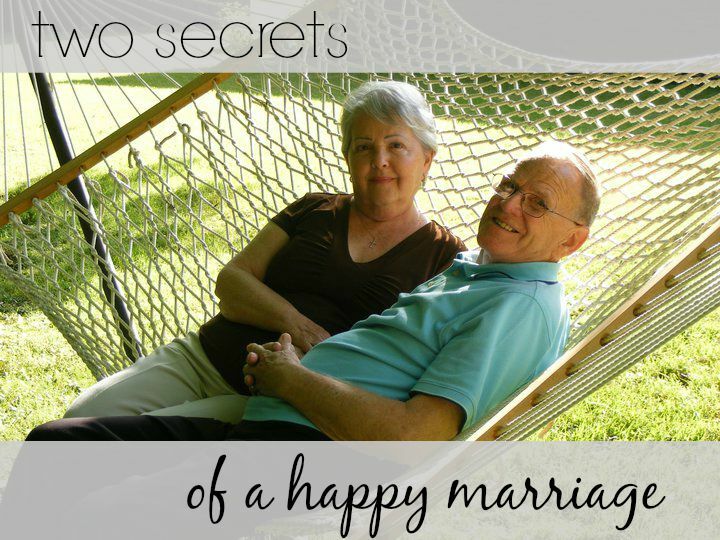 Here are two secrets of a happy marriage from two people who have loved being together for 60 years. #1 Look at your spouse the same way you did the first time you saw him. Remember what attracted you to him. 60 years gives a couple a lot of chances to annoy and irritate each other. Taking this advice makes those 60 years much more enjoyable and full of love! What attracted you to your spouse? Write those things down and look back on your list the next time a habit irritates you. #2 Marriage isn’t a 50/50 deal. Both of you have to give 100%. This piece of wisdom came from Papa. Again, I can’t remember how he worked it in to our conversation, it just came up so naturally. I know this is something Papa lives by. I’ve only observed the retirement years of their lives where they share household duties and work on projects together. But I don’t think he was just talking about household duties and financial responsibilities. For example – Papa recalls the custom of his childhood days where everyone wore their Sunday church clothes for most of the day. He continues this habit for the reason that it’s the Lord’s day and that’s how he dresses for church, but also because, “Your Nana sees me in my regular clothes all week and out of respect for her, I like to stay dressed up.” Giving 100% begins in our hearts and manifests itself in our actions. Are you giving 100% to your marriage? I know my grandparents read my blog – so thank you, Nana and Papa, for your example and your advice! Such good advice! I love how you said give 100% because we often forget that fact! Thanks for sharing this at Tues Talk. Thanks for visiting me, Keri! I need that reminder too! Your grandparents are ADORABLE! I love that they weave marriage advice into every day conversations without even realizing it or seeming preachy. They have wise advice. I love the give 100% which can be hard if you start focusing your attention on too many things. I also love the advice of always seeing the best in your spouse. I’m taking notes from your wise grandparents. What sweet advice!!! Thank you so much for sharing their wisdom. It’s so easy to get derailed with the day to day annoyances and stress, but focusing on one another is so important! You’re right – it’s so easy to focus on the wrong stuff! This is so sweet, and such great advice! No wonder they’ve been together so long with those outlooks:) Thanks for sharing. Thanks, Tif! They’re pretty special people! Whitney, you humble me and honor us all in the same breath. Thanks for your kind words, we both have been blessed to find in each other the traits we thought Godly and successful for a long and happy life together. Great advice! I love the advice that it isn’t always 50/50. Isn’t that great? Thanks for stopping by, Lisa! Yes, we are SO blessed! Very good advice Whitney…We are closing in on 40 years and I echo their thoughts!! 40 years – love that!!! Brings tears to my eyes as I read this because I’ve watched them live this out first-hand. We are blessed. Thanks for sharing these Wise words – it will encourage many!